My grandparents took me to see The Color of Money at the movies in 1986, when I was around fifteen. At the time I did not know it was a sequel, or even that The Hustler (1961) existed at all. Many years later I realized Paul Newman had played the same character in both those films, yet I never got around to watching The Hustler until recently. The Hustler is the story of “Fast” Eddie Felson (Newman), a reckless pool shark who wants to make a name for himself in the world of high-stakes wagering. Along the way he sells his soul to a disreputable gambler (George C. Scott), gets his thumbs broken by a bunch of thugs, and falls in love with a broken alcoholic who suffers from depression (Piper Laurie). As you can probably tell, it’s not a cheery film – we’re talking intense performances (Scott in particular is menace personified), powerful B/W cinematography by Eugen Schüfftan, and a no-nonsense approach by co-writer/director Robert Rossen. I particularly love the fact that The Hustler ends on what must be one of the biggest downers in movie history: Sarah kills herself after failing to convince Eddie to quit playing, and although Eddie does beat a legendary older player, “Minnesota Fats” (Jackie Gleason), he decides to give up the life altogether, morally bankrupt and adrift. Damn it, I need a whiskey now. 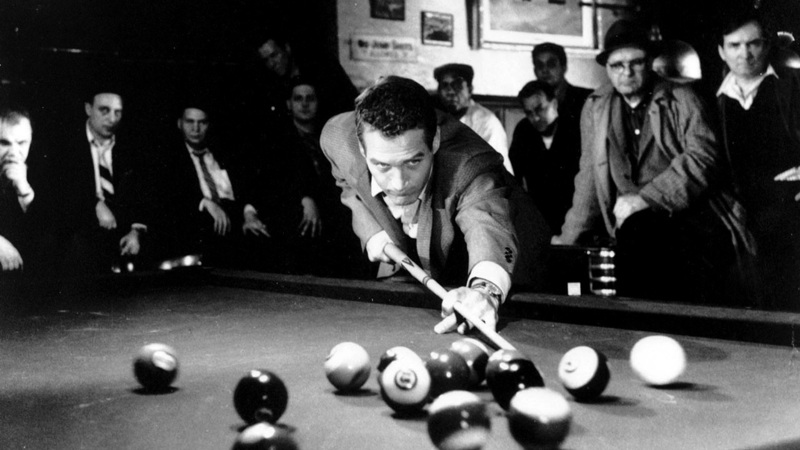 Martin Scorsese’s The Color of Money, made 25 years later, has all the flashy stuff down: Awesome close-ups of pool tables and cracking balls, cool editing, a curated soundtrack. But what it doesn’t have is the dramatic weight of The Hustler. Newman again plays Fast Eddie, now a liquor salesman who meets a wet-behind-the-ears pool prodigy (Tom Cruise) and takes him under his wing. This could’ve been an interesting take on the first movie, with Eddie mentoring –maybe even corrupting? – a kid who, in essence, is a younger version of himself. But as Eddie realizes he’s still got what it takes, The Color of Money shifts from a story of potential redemption to a sports drama about getting back on top. It’s an odd choice. In keeping with the climax of the original film, Eddie should be more damaged, more haunted by his past. Instead, he’s just an old guy trying to regain his youth… and it doesn’t ring as true. Newman may have won an Academy Award for his performance in The Color of Money, but it’s in The Hustler where he really shoots a great game.